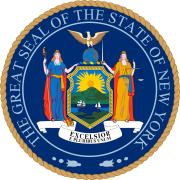 The 2008 New York State Legislature Primary Elections took place on September 9, 2008 and the general election was held on November 4, 2008. All 150 members of the New York State Assembly and all 62 seats of the New York State Senate were up for election. There are no term limited members as New York does not have term limits for positions at the state level. Members of the Assembly and the State Senate serve two year terms. The State Senate was heavily contested as the Republicans held a one-seat majority going into the election. The 2008 Presidential election occurred on the same date as the general election. The election saw the Democrats take control of the State Senate and gain one seat in the State Assembly. However, they would relinquish control of the Senate to the GOP in June during a leadership crisis. ^ "Senators by District". Archived from the original on 2008-09-28. Retrieved 2008-09-18.